She's our big bad Marta Beast—and she's three years old today! 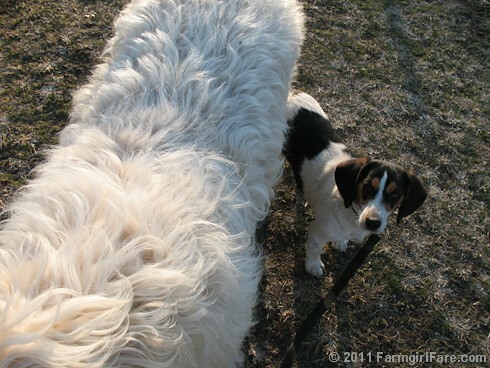 © FarmgirlFare.com, the party hardy foodie farm blog where Marta, who is a sweet (and enormous!) 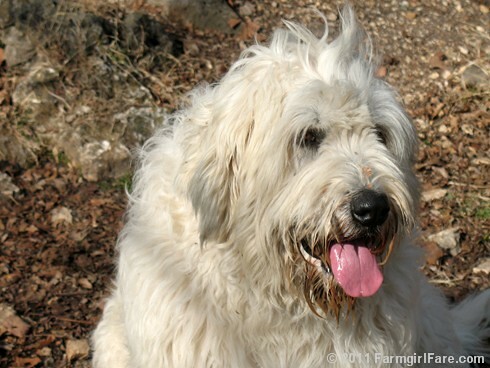 livestock guardian dog, basically has two looks: pissed off and pink tongued. She's usually not as mad as she appears to be (unless she's scaring away predators), and itty bitty Bert has actually convinced her to chase him around and play a couple of times. Talk about cute. Marta turns Three--Happy Happy Birthday, Big Girl. Thanks for the lovely pic essays every day despite your busy busy days. They are very cute!! Hope you had a good day. Oh my gosh! What cute doggies! 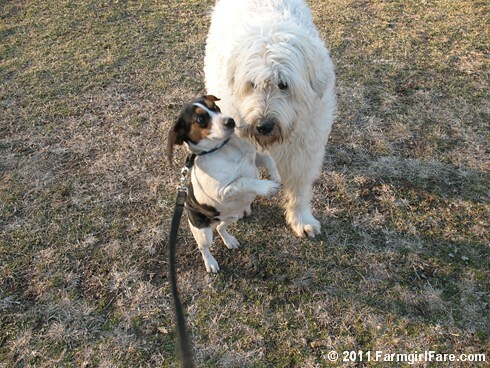 We have a wheaten Terrier and she reminds me a little of the big white fluffy one in the pics. Happy Birthday Marta! How lucky you are to get a puppy for your birthday! That pup looks personality packed! Happy Birthday to Marta. And many more. Found your blog through BlogCatalog. Love your theme, cute pics and daily farmlife depiction. i don't comment enough, but wanted to say that i love seeing your farm pics (animal pics), they bring a smile to my face each day! Terrific personality pics - Happy Birthday Marta and dear little Bert - he is obviously saying "look at me look at me" he'll be a good companion for everyone as soon as he can be trusted off that leash - all things in due time. What a beautiful girl (and her little friend, too)! Your pictures and posts are always so cheerful and fun. Thank you for taking time out of your busy life on the farm to share every day! That is too cute. Love the pictures. Happy Birthday, Marta! You are one beautiful girl - may you have many happy birthdays ahead of you! 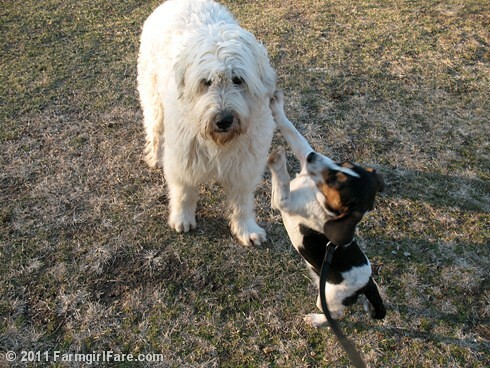 And lucky Bert has a wonderful playmate - Great Photos! thanks so much for sharing them!